Every month, the Korea Tourism Organization releases a list of recommended travel spots across the country. This month’s suggestions consist of countryside villages that present a soothing atmosphere amid natural surroundings, though they may not be particularly fancy or glamorous. 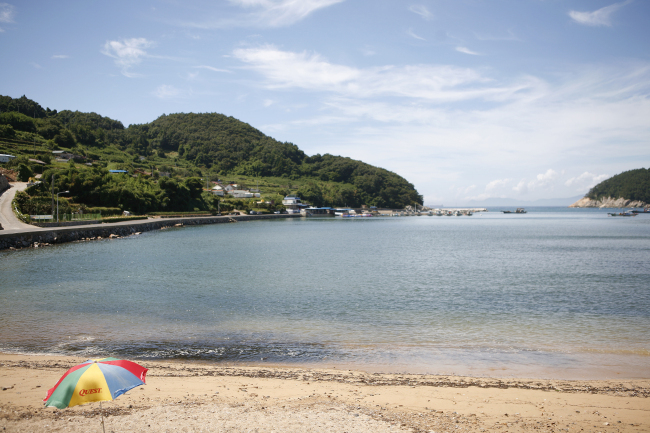 The recommended destinations include a camping site in South Jeolla Province, a forest in Gyeonggi Province, and a village to enjoy kayaking and other water sports in the southernmost town in Namhae. The southernmost region of Namhae is known for its stunning scenery. In particular, Dumo Village is a place that attracts many foreigners. Kayaking is one of the most popular attractions here, as the calm waters off the coast allow even beginners to move around easily. Dumo Water Playground is equipped with camping grounds as well as facilities to enjoy other water activities, such as snorkeling and riding on banana boats. Snorkeling and kayaking cost 20,000 won per person, while fishing fees are 30,000 won. Campgrounds are offered at 30,000 won between November and February and 40,000 between March and October. The rate peaks at 50,000 won between July 25 and Aug. 15. Hands-on farm programs are also available, and the fields surrounding the village bloom with canola flowers in summer and buckwheat flowers in fall. Nearby attractions include Geumsan, Kim Man-jung’s House of Exile, Seobulgwacha, Maneulnara (Garlic Land) and Sangju Silver Sand Beach. Water sports activities are limited to those 8 years old and above, and operating hours are between 9 a.m. and 6 p.m., or until sundown. Pets are permitted, but they must be kept on leashes. 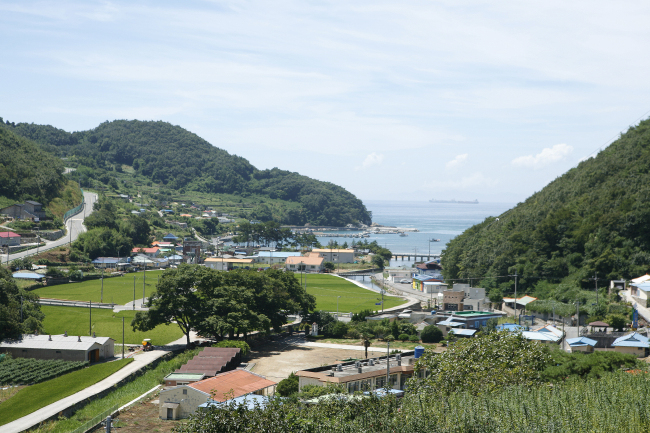 The homepage for Namhae tourism is http://tour.namhae.go.kr/main.web (Korean, English, Chinese, Japanese), and for Dumo Village, http://du-mo.co.kr (Korean). The forest is home to the nation’s largest number of pine nut trees -- jat referring to pine nut -- with tourism programs focusing on the beauty of the natural habitat in the region. There are exhibitions in the forest, and visitors can read commentaries on plant life. Other hands-on programs include making meals with agricultural products of Gapyeong. The park is closed every Tuesday. 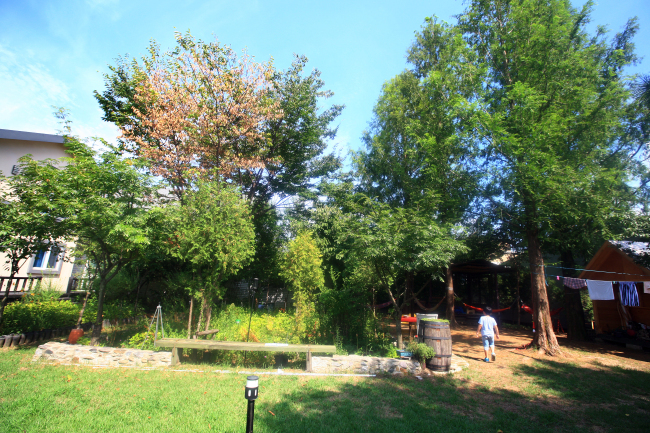 Other places to visit in Gapyeong include The Garden of Morning Calm, which is a year-round place that has scenic walkways and 20 different themed sections, and Cheongpyeong lake, which offers water sports. Petite France, a French cultural village consisting of 16 French-style buildings, offers lodging and experiences related to French food, clothing and culture. An hourlong train ride from Yongsan Station in Seoul will get you to Gapyeong Station, which operates between 6 a.m. and 10:48 p.m. daily. A bus is available at East Seoul Intercity Bus Terminal until 10:05 p.m.
For more information in Korean, English, Japanese or Chinese, visit the Gapyeong-gun tourism website at www.gptour.go.kr. Petite France also provides information in four languages at http://www.pfcamp.com. The name Jaengang, or Jayanggang may sound unfamiliar to outsiders, but it is what locals in Chuncheon used to call Bukhan River before Chuncheon dam was built. 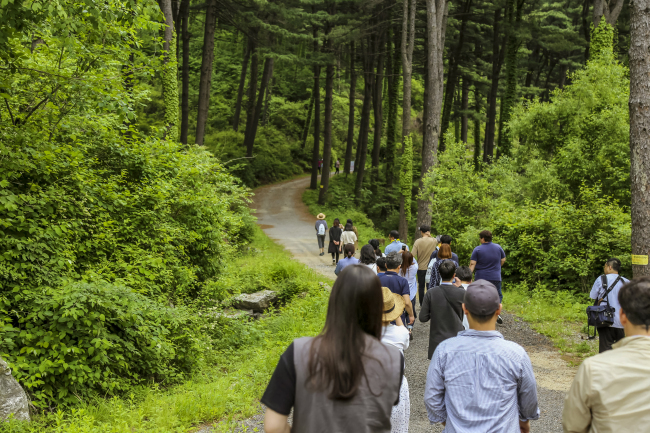 Jaenggang Cooperative is a collection of five guesthouses operated by six groups in Chuncheon, offering tourism programs in the countryside including bike tour and canoe rides. The bike program allows visitors to ride along the river and complete “missions” at the five guesthouses. Guesthouse Nabiya uses the pillars, doors and structure of Korean traditional hanok, and has designs and paintings in the Joseon-era style. Other neighboring guesthouses each have distinctive styles. The Chuncheon tourism website (http://tour.chuncheon.go.kr/) offers information in Korean, English, Chinese and Japanese, and you can find out more about the Jaenggang Cooperative at https://clank.modoo.at (Korean). The southwestern city of Yeosu is known for its beautiful beaches, and off its coast lies several islands including Geumodo. The campground is on an old school site, and water sports can be enjoyed on the beach off the school grounds. In addition to snorkeling, diving and sailing, you can also go fishing. A guesthouse -- which has six rooms that are remodeled classrooms -- is also available for those who did not pack their tents. The seaside walk along “Birunggil” extends for five courses across 18.5 kilometers for up to two hours. A ferry to the island leaves from several sites in Yeosu, including the Yeosu Passenger Terminal. But the one with the shortest distance to the island leaves from Shingi Dock in Dolsando, which is connected to the city via Dolsandaegyo Bridge. The ferry leaves from Shingi Dock seven times a day, and it takes 25 minutes to reach Geumodo. 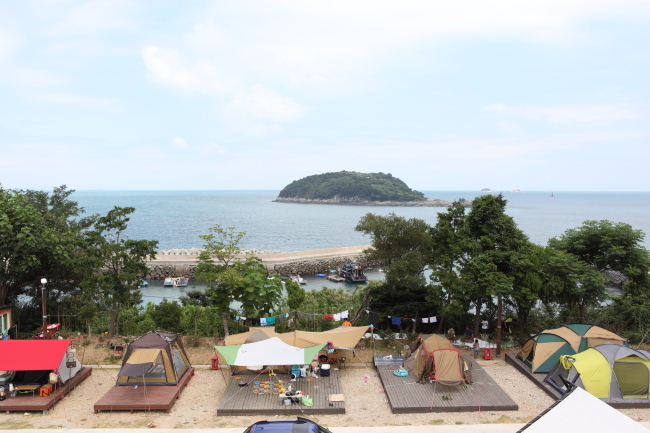 The Yeosu tourism website (http://tour.yeosu.go.kr/) offers information in Korean, English, Chinese and Japanese, and Geumodo campground’s homepage is https://campgold.modoo.at (Korean). 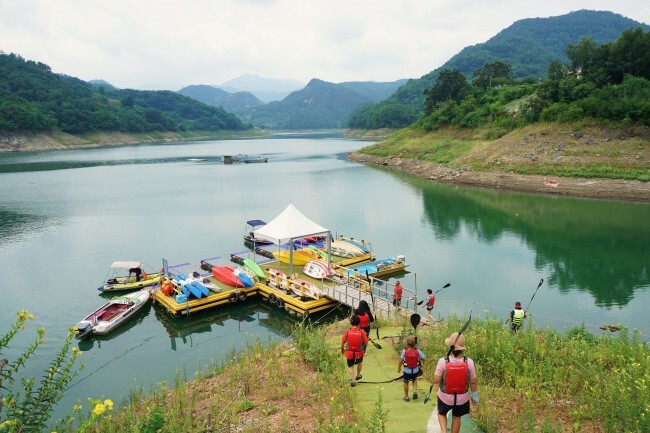 The lake located in the city of Jecheon offers attractions like kayaking, canoeing and monorails. Drifting across the lake and enjoying the scenery is what makes it so appealing, with the sight of the Oksunbong peak unfolding just as you leave the dock. Guides/lifeguards hang around on a motorboat to take photos. Adjacent to the docks are an agricultural market and a place where you can try traditional Korean archery. Cheongpung Land, a 20-minute drive away from the kayaking spot, has bungee jumping and other extreme sports. Cheongpung Lake Monorail, which connects Dogok-ri, Chungpung-myeon and Bibongsan, stretches 2.6 kilometers and makes the trip in 20 minutes. The operating hours are between 9 a.m. and 4 p.m., and it is closed between December and February and the first and third Mondays of every month. Round-trip tickets cost 4,000 won for adults and teenagers 3,000 for children and seniors and 1,500 won for people with disabilities. For more information in Korean, English, Japanese or Chinese, visit tour.jecheon.go.kr.